What some may know as one of the most beautiful pieces of musical literature is a work of music that has been in the hands of musicians and lovers of music for centuries. MBU’s Chorale will be performing Handel’s “Messiah” Parts Two and Three at 7:30 p.m. Friday, April 20, at Pillsbury Chapel in the Fine Arts Center at Missouri Baptist University. MBU Chorale’s director Jordan Cox, MBU’s assistant director of music and director of choral activities, is looking forward to such an opportunity. According to, “The Glorious History of Handel’s Messiah” by Jonathan Kandell, “Handel composed ‘Messiah’ in an astounding interlude, somewhere between three and four weeks in August and September 1741. “He would literally write from morning to night,” said Sarah Bardwell of the Handel House Museum in London, quoted in Kandell’s story on Smithsonianmag.com. Handel’s genius was recognized by one of the largest musical greats of all time, Wolfgang Amadeus Mozart. “Mozart paid Handel the supreme compliment of reorchestrating ‘Messiah’ in 1789. Even Mozart, however, confessed himself to be humble in the face of Handel’s genius. He insisted that any alterations to Handel’s score should not be interpreted as an effort to improve the music,” Kandell said in his December 2009 article on the Smithsonian magazine’s website. What an undertaking it is for Chorale’s director Cox to choose such a revered piece of musical literature. “At MBU we have had a tradition for many years to perform Handel’s ‘Messiah’ every four years. 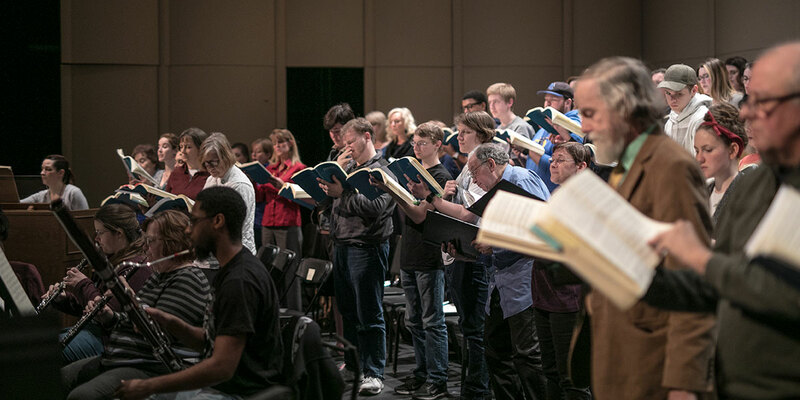 This is one of the greatest and most popular master works in the choral canon and we believe every MBU choral student should sing it at least once before graduating,” Cox said in an email. MBU splits the piece into two seperate sections and performances. “Because it is such a long work, we break it up performing Part I (about the prophecy and birth of Christ) at Christmas and Parts II & III (about the passion, resurrection and ascension) at our spring concert which is often near Easter. It is challenging, but attainable, and very fun to sing,” said Cox. With that undertaking, challenges are bound to arise for the Chorale members. “Melismas are one of the hardest things. I did not actually know they were a real thing until I started singing this work of music,” Sandvoss said, explaining that a melisma is the singing of a single syllable of text while moving between several notes in succession. Emotionally, Handel’s piece of musical literature paired with heartfelt lyrics display deep meaning. “Parts II & III focus on the passion, resurrection and ascension of Christ. Every believer will recognize the Scripture that is woven into the text and is an excellent work to be rehearsing during the Lenten season,” said Cox. The music portrays some of the deepest emotions of Christ’s journey on Earth. “The music has a hard way of expressing itself. Once you have heard it a few times, once you have read it and sung it, you can really tell when the stories are really grim and mean and angry and when sometimes they are so joyful and happy expressing the words of God,” said Sandvoss. “The Glorious History of Handel’s Messiah,” by Jonathan Kandell on Smithsonianmag.com, includes interviews with many prominent directors and conductors throughout Europe. Handel’s work abstractly portrays the life of a believer. Certain choruses in Handel’s work manifest the life of a believer musically. Freshman musical theatre and music education major, Cameron Tyler, a performer in this semester’s production of Handel’s “Messiah,” describes why he loves this piece of music. “I love it. I get to learn about how people used to worship God and how these songs by themselves are random but together show a beautiful story,” said Tyler. “I love performing with a live orchestra. It makes the music seem even more dramatic and meaningful,” Tyler said. Students performing in “Messiah” are looking forward to the opportunity to sing with a live orchestra. “I’m most excited to get to sing with an orchestra. I love hearing all the voices and instruments come together,” said McDonnell. Excitement is rising among the student performers. “I think it is really important for everybody to come and listen to what we have been working on for so long. There are many student soloists and a couple of student conductors featured as well, which is really exciting to get to see,” said Krekeler. Amidst all the work Chorale has put into the piece, performers want anyone and everyone to come and experience the piece for themselves. “Everyone needs to hear this because it is a story that needs to be heard and it is a timeless story that will forever be in our hearts,” Tyler said. “’Messiah’ is a work that’s familiar to our culture. Even ‘non-music’ people will recognize at least the ‘Hallelujah Chorus’ at the end of Part II. This is certainly a work that all academics should be familiar with and to have an opportunity in our own space to hear it with a professional orchestra and for free is a tremendous educational experience,” said Cox.